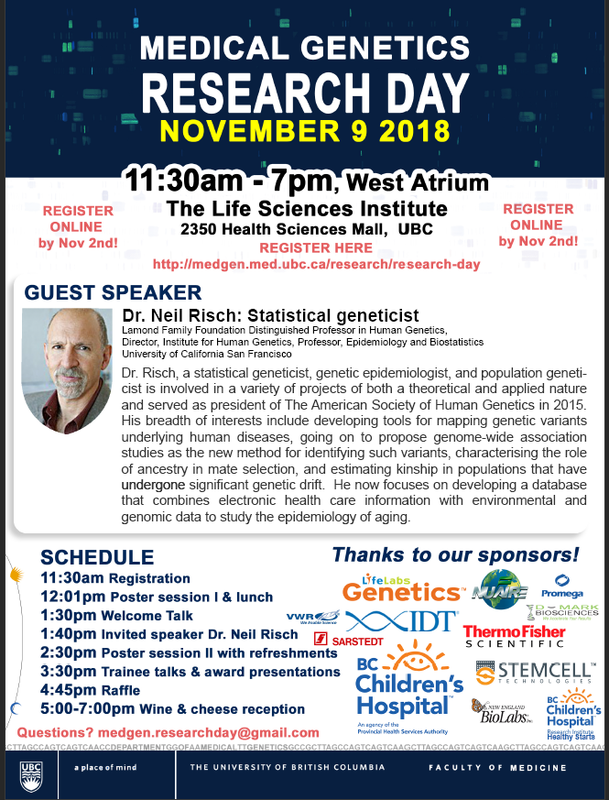 Medical Genetics Research Day brings together students, staff, and faculty from all of our Vancouver lab locations to celebrate the high-caliber research in our Department. Poster sessions and trainee talks showcase the research projects of our students and post-doctoral fellows, and offer a platform for networking both with other research groups, as well as with the companies that support our valuable work. Poster Competitions: Genetic Counselling students; and MSc and PhD graduate students whose supervisors are Medical Genetics faculty, are encouraged to present their research in a poster format. Registered posters are automatically entered to be judged for prizes offered in the junior, senior, and Genetic Counselling research categories. Post-doctoral fellows with Medical Genetics research supervisors are welcome to present posters but are not eligible for prizes. Patricia Baird Prize recognizes excellence in Medical Genetics research by trainees. James Miller Memorial Prize is awarded to a senior PhD student excelling in the areas of leadership and integration of basic science with clinical medical genetics. Teaching Assistant Award is determined each year from students’ course evaluations. The award is presented to the Teaching Assistant who showed exceptional dedication to teaching, was consistently accessible, stimulated interest in the course, and communicated effectively during tutorials, on Connect, etc. Teaching Award alternates between a clinical and basic science faculty researcher who has excelled in their teaching duties in the Department of Medical Genetics. Registration for Research Day 2018 is now closed. Last minute registration can be sent to medgen.researchday@gmail.com . We are still looking for faculty or post-docs to be poster judges.